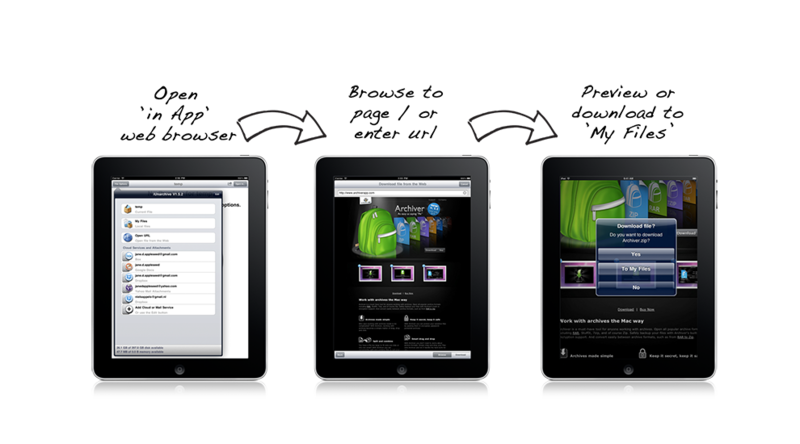 Access your files located in the cloud from your iPad? ...it's an App for that! Unzip from within the Mail App? Transfer from mail to cloud? Download & unpack from web? Transfer your .pdf to iBooks? iUnarchive supports connections to several well known cloud services. For examples on how to use iUnarchive connecting to cloud services, click here and take a look at the use cases. iUnarchive enables you to connect to mail services to browse for files to unpack, preview, download, move, or store. Instead of cluttering the disk with files you can preview and open files directly from within iUnarchive. With iUnarchive, you can create, modify and open archives. You can open passworded .zip and .rar files, nested archives and a truckload of other archive file types. You can preview images, documents, presentations and view programming language source files including syntax highlighting. You can search within the archive for a file name or expand and collapse folder trees that display the file path in the search results. iUnarchive makes it possible to preview files without actually having to extract them first. This saves time when you just want to preview a couple of files in a large archive. What's even better, you aren't cluttering you disk with folders and files trying to find that one file you need. If you are looking for just one or two files to preview in a huge archive, you can use iUnarchive's search functionality. When you want to find a specific file or only want to display files of a specific type for instance, you can use iUnarchive's integrated archive search feature. With iUnarchive you can also preview programming language file types including syntax highlighting. 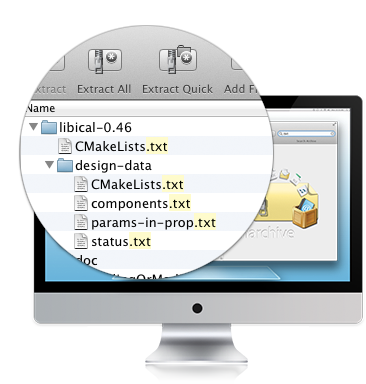 Supported types include c, h, cpp, hpp, cs, html, css, js, java, php, py, rb, sql, xml, xsl and wsdl, depending on which Quicklook plugins are installed. tar.bz2 can be created and updated. 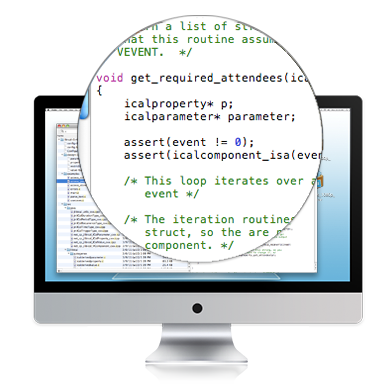 Syntax highlighting for c, h, cpp, hpp, cs, html, css, js, java, php, py, rb, sql, xml, xsl and wsdl, depending on which Quicklook plugins are installed. Click here to go to the iUnarchive download section. 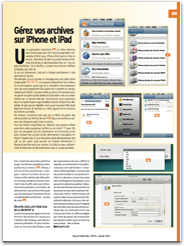 iUnarchive has been reviewed by Vous et Votre Mac magazine in edition #74 for January 2012. The French magazine which is focused on Apple software and hardware can be found in news stands in France, Belgium and Switzerland. 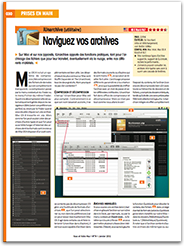 The article reviews both the iPad & iPhone version and the Mac OS version of iUnarchive. A PDF version of the article with both reviews can be found here. iUnarchive has been awarded 4,5 out of 5 stars by Vous et Votre Mac magazine. The website Applebites offers a limited amount of free redeemable iTunes codes for iUnarchive on their website. Applebites has also reviewed iUnarchive. The review can be found at the same page as the redeemable iTunes codes givaway. 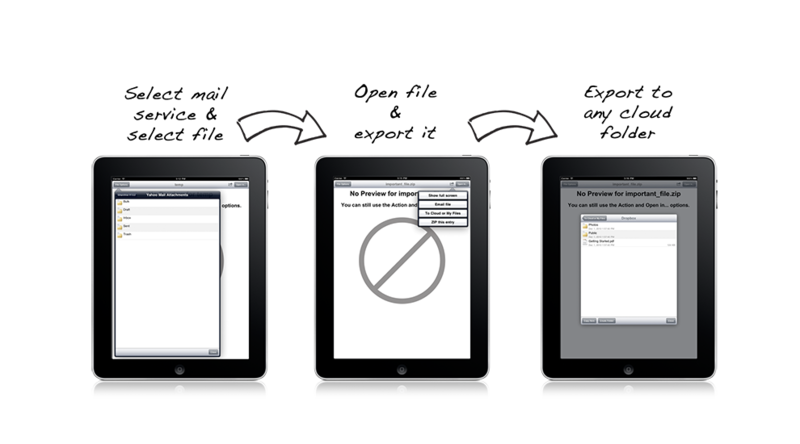 "iUnarchive app has eliminated my last remaining issue with solely traveling with an iPad: the inability to deal with .zip files or certain email attachments or download links from places like YouSendIt. Previously, I was just out of luck until I got home to my computer for some of these things, which can be a real drag." 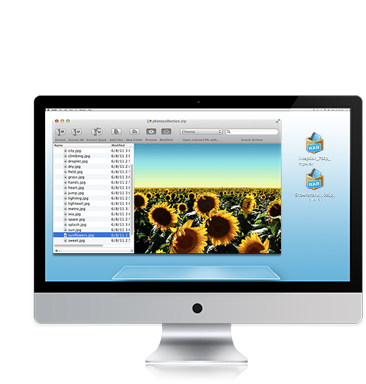 The website AppleZein describes how iUnarchive "allows for better management of any compressed archive when received via email or saved to an online cloud service" and has called the Mac OS version of iUnarchive "the right application to better manage and use compressed archives". 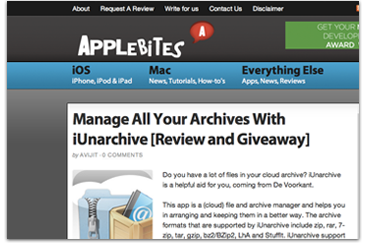 AppleZein has reviewed both the Mac OS and iOS version of iUnarchive on their website. 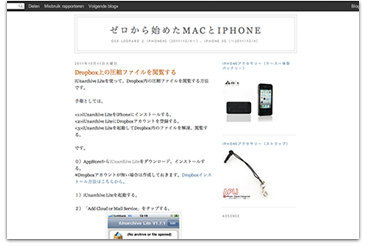 The Japanese website Mac-and-iphone.blogspot.com describes how iUnarchive can be used to preview archived files stored in cloud services like Dropbox. Another article on the website also focuses on how iUnarchive can be used to show a list of attached archives which are sent to your email and how to proceed to preview these files before deciding wether or not to extract any of them. 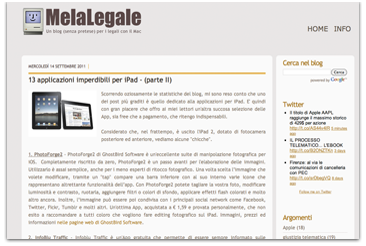 MelaLegale has mentioned iUnarchive in it's list of most essential Apps to have installed on your iPad. Where in iUnarchive can I access the files that i have stored in iCloud? To access your iCloud files in iUnarchive, first make sure you have enabled iCloud under the device's iOS settings and then kill and restart iUnarchive. Now in iUnarchive go to 'My Files', select the iCloud icon and you should see your iCloud stored files. Also, iUnarchive will not be able to directly access files in other containers, like files saved in iWork (Pages, Numbers and Keynote). These files cannot be opened from iCloud by third party Apps and can only be opened by Apple iOS Apps. If you want to open iWork files from cloud you could store them using a free Dropbox account. iWork files stored in the Dropbox cloud can be opened by third party Apps like iUnarchive. How do I open a file from within Apple's Mail App? With the current iOS version you can click the file so it starts downloading. When it's finished downloading you can click it to pop-up a menu that lets you select Apps to open the file with. Older iOS versions might require you to touch and hold the file until a window pops up that lets you choose a program to open the file in. The archive won't open when I select 'Open in iUnarchive'. What can I do to fix it? Pre iOS 5 there is a bug where when you only have one program installed that can open the archive, it won't open the file or it will result in an error. To fix this situation you could install another App that allows opening archives (e.g. FileApp, a free non Pro version) and then chose the bottom 'Open in' option and then choose iUnarchive to open the file. Do I have to touch and hold to open or is there an easier way to open a file with iUnarchive? With the current iOS version you don't have to 'Touch and Hold'. Pervious iOS versions might require you to touch and hold to open a file in another App, there was no other easy way to do this from within the 'Mail' App. You can also add an IMAP or POP3 account to iUnarchive, which will enable you to open all attachments with ease. How do I delete files from 'Current Archive' after I've downloaded them to iUnarchive? It should not be necessary to delete the Current Archive or a file contained by it. The Current Archive will be replaced by another one if you use the 'Open in...' function from e.g. Mail. Also, if you 'kill'* iUnarchive the Current Archive will be cleared. In the My Documents folder, you can remove files by swiping or in edit mode. I want to download a file from the internet to iUnarchive's 'My Files' storage. How can I do this? Select 'Open URL' in iUnarchive. Type or paste the URL to the website you want to browse to. (You can also browse for files using search engines like Google, Yahoo and Bing) Now select the download link the file is located at. If you want to download a file that does not have a download link you can switch to 'url download mode' using the browse/download button. Just switch to download mode and paste or type the file location in the URL bar. iUnarchive is locked and I forgot my password. How do can I start using iUnarchive again? The iUnarchive (lock) password can be reset (disabled) by uninstalling iUnarchive and installing it again. Please note, that you will lose files stored in My Files and the configurations if you uninstall iUnarchive. You can copy files stored in My Files through iTunes File Sharing. I've unpacked a zip file to a wrong folder. All my files are mixed up now, can I clean up my folders somehow? Yes you can move files to other folders after unarchiving. Select the edit button when in 'My Files'. Now select all the files you want to move and select the move button. Select the folder you want to move the files to, or create a folder to move the files to. Select the 'Move here' button. The files have been moved to the specified location. I have a multipart rar which I would like to extract using iUnarchive. How do I extract multipart archives? First make sure all of the archive parts are present at the same location within 'My Files'. Ideally you would copy all the files to the same folder at once. If the parts are in the cloud (e.g. Dropbox) and you have the connection added in iUnarchive, you can select the edit button and mark all the files before copying them all to the desired location in My Files. 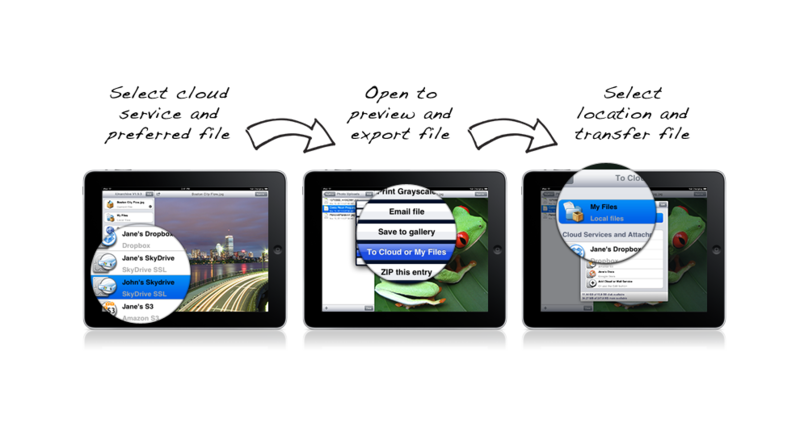 You can also use iTunes File sharing to copy all the parts to My Files in one copy action. Connect your device via USB cable and open iTunes. In the left menu select your device. Now select Apps under the tabs in the top center. 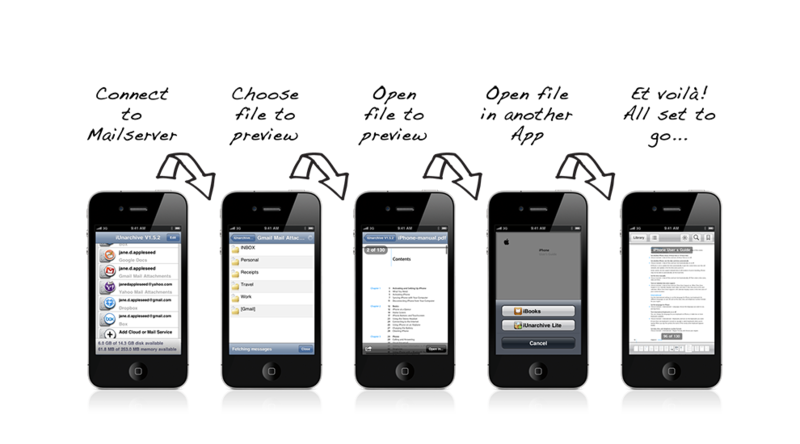 Select iUnarchive in the File Sharing section and your 'My Files' (In App) storage will be accessible. You can drag and drop files to the right section of the File Sharing section or use the buttons 'Add..' and 'Save to...' to transfer your files via USB. If the files are located in another App you will probably have to copy them one at a time. When copying individual archive parts to iUnarchive you will be asked if the archive should be unpacked. Select 'No', then select the action menu (top right corner on the iPad, lower left corner on the iPhone, possibly you have to tap the screen to make this visible) and select 'To Cloud or My Files'. Now select My Files and navigate to (optionally create) the desired folder (all parts have to be stored in the same folder) and select 'Copy here' (lower left corner). Repeat these steps for all the parts, manually navigate back to the home screen of iUnarchive, select My Files, navigate to the folder containing all parts, select any part and answer 'Yes' to question if you would like the archive to be unpacked. Can I transfer files from and to iUnarchive using a USB cable instead of sending it using an internet connection? Yes, you can transfer files to or from iUnarchive via iTunes. Connect your device and open iTunes. In the left menu select your device. 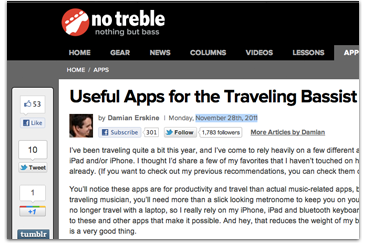 Now select Apps under the tabs in the top center. 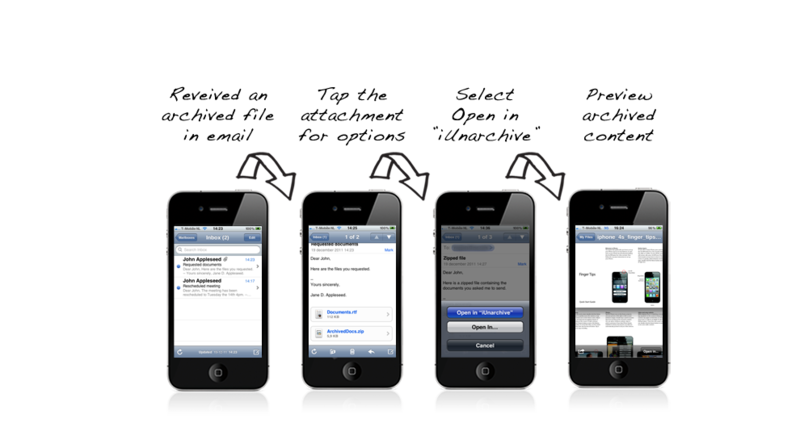 Select iUnarchive in the File Sharing section and your 'My Files' (In App) storage will be accessible. You can drag an drop files to the right section of the File Sharing section or use the buttons 'Add..' and 'Save to...' to transfer your files via USB. Copyright © 2019 De Voorkant B.V.